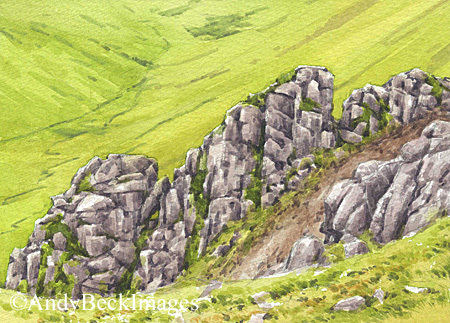 As I am in the process of putting the finishing touches to the text for the Wainwrights in Colour Book (more news on that to be posted shortly), I often get frustrated that the limitations in the design of the book means that I am unable to go into full detail about many of the sketches and how I acquired them and besides, it is the watercolours which are more important rather than the background story. As some people may find these details of interest I thought about posting a series of articles about the long task of obtaining the reference photographs for the Wainwrights in Colour project. If you read this first example and enjoy it then do make sure you subscribe to the website using the simple form on the right hand panel and when I post a new blog you will get it into your email inbox. Rampsgill Head summit crags- Rampsgill Head 3, The Far Eastern Fells, Book 2. It was on a long linear walk from Pooley Bridge to Troutbeck back in June 2008 that I had planned to tick off not only several fells but also a many references as possible, this was the advantage of being dropped off in the north and then having transport awaiting me at the Mortal Man at the end of the day. Ten fell summits and twenty three references in nine hours of walking was certainly a full and successful day. The route over the High Street range of fells in the Far Eastern region isn’t actually that taxing but with my routes tending to zigzag all over the place in search of odd locations I ended up covering nearly 16 miles, I was ready for a pint at the end. Two of the sketches that were produced from that day were the pair on the page Rampsgill Head 3 page. Wainwright fills practically the whole page with 2 sketches and a short descriptive detail of this arete. To simplify the page he omitted any background in both drawings which means that it is difficult to determine whether he was looking up, down or level at this outcrop of rock. Only when I actually stood close to the location did I realise that for both instances was the viewpoint from above. This edge of rock is probably the most interesting feature of this fairly nondescript fell and by filling up the page with the subject it enabled him to expand the fell to an even number of pages as was usual. This aspect has the length of Rampsgill Beck snaking through the valley far below. To align the foreground rocks on the right with the scree gully and the crag behind required a careful manoeuvre on to a grass slope with a steep drop below. The two notches in the ridge were there but the left one had a chockstone in it now. When seen from the east the same arete takes on a slightly different profile but still with a commanding view over the valley. A careful look down gave a superb view of up to a hundred red deer quietly browsing the grass. This is a really quiet location and I am sure this viewpoint is unknown to many, usually Rampsgill Head is only visited for a quick visit to the summit cairn to tick it off the Wainwright list. 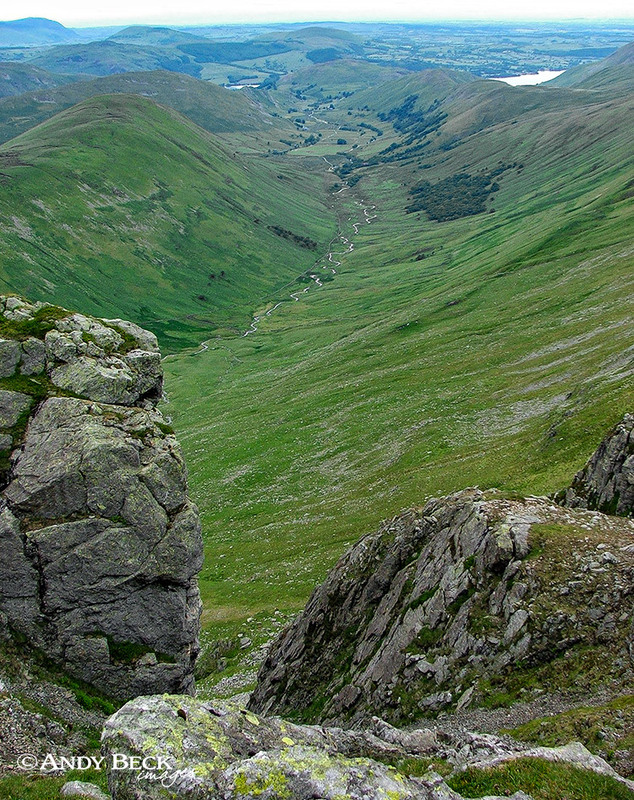 The view down the gully along the Rampsgill Beck valley with Ullswater away in the distance (below). This was in the days where I used a simple compact camera s the quality of the image isn’t up to much but this is a location which will lend itself to a much better photograph but I had what I needed, the sketches allow me to interpret the photographs and giving the scene a better depth compared to how the light on the day was rather flat. So I then continued on my way, up over High Street, Thornthwaite Crag and Troutbeck Tongue before that well deserved pint at the pub. Another day done and references in the bag. 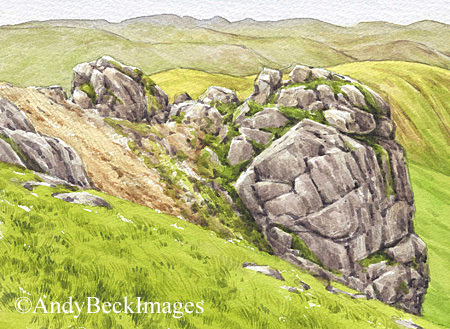 To see the rest of the sketches from Rampsgill Head click here. If you enjoy this sort of write up do let me know and I will continue to post on various topics about this 10 year adventure.